By now, we all know how our many recent past Presidents worshiped the Federal Reserve Chairman’s, and how this private banking organization called the Federal Reserve controls our whole economy…at least some of us do. The average man doesn’t think much about the Federal Reserve because, besides Ron Paul, you won’t catch ANYBODY anywhere saying anything against it. No politician dares speak of it. So, I thought I’d take an excerpt out of Judge Napolitano’s book, It Is Dangerous to be Right when the Government is Wrong, to help us all remember, the true history of the Federal Reserve, and how it has been the cause of so much misery. On November 22nd, 1010, Senator Nelson W. Aldrich (R-Rhode Island), with five companions, set forth under assumed names in a privately chartered railroad care from Hoboken, New Jersey, to Jekyll Island, Georgia, allegedly on a duck-hunting expedition. The need to maintain secrecy was extremely important to the men who were aboard the train traveling to J.P. Morgan’s private retreat at the Jekyll Island Club. The full guest list would be later revealed as including Senator Aldrich (Rockefeller kinsman,) Henry P. Davison ( a J.P. Morgan partner), Paul Warburg (a Kuhn Loeb & Co. partner), Frank A. Vanderlip (a vice president of Rockefeller’s National City Bank of New York), Charles D. Norton (the president of Morgan’s First National Bank of New York), and professor A. Piatt Andrew (Head of the National Monetary Commission research staff), who had recently been made an assistant secretary of the treasury under President Taft, and who was a technician with a foot in tin both the Rockefeller and the Morgan camps. These powerful banking elites would devise the new central banking system and draft what is now known as the Aldrich Plan. The Fed was given a monopoly of the issue of all bank notes: national banks as well as state banks. All nation banks were “forced” to become members of the Federal Reserve System. A lower interest rate means it is less painful to the government to borrow money. This system led to the national debt ballooning from $2.6 billion in 1910 to $25.9 billion in 1920, which also led to the sharp spike of inflation that followed. The great nations of the world would abandon the gold standard in order to print money to fund World War II. With the massive debt accrued by European nations to fight the war, as well as the need for the United States to pay its bills for the war, a new monetary sits had to be formed. Shortly after World War II, Lord Keynes and Harry Dexter White, a U.S. Treasury official, propared the plans for a new global financial system. 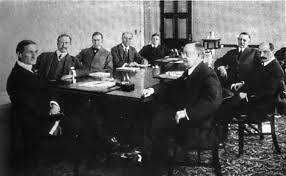 Representatives of the financial rulers of the United Nations assembled in Breton Woods., New Hampshire, and they enacted the new global monetary system. Massive increase in the money supply or inflation, by way of fractional reserve banking and a fiat based monetary system, causes prices to rise as well as the boom and bust cycle. The people who benefit from this inflationary system are the ones who get their hands on the money first, the banks. And it’s funny….Every day we hear how the Feds will not raise interest rates, because then the government can continue to borrow at 0 percent. I have read way too many articles saying that it’s all going to collapse, and soon. In the meantime, the rich are getting MUCH richer, as if they all know what’s coming and like squirrels they are gathering as many nuts as possibly to last out the winter ahead. The crash of 2008, was basically a major theft of the American people. We really haven’t recovered and Obama’s policies, Like FDR’s has made the economy worse. Still, thanks to the Fed Chairman’s, ..the stock market continues to soar. Good for people who own stock. Not so much, for the majority of the people. And the dollar, is only worth about 30 cents. Wouldn’t it be something to one day, go to the morning Drudge report, see the pictures of all the men who run and profit from the Federal Reserve, their names, and their incomes? Nobody Wonders how much they are all worth NOW— don’t you?